Discover our top picks for Simple Jewelry pieces that match any style! Sometimes, less is more when it comes to jewelry. This is why we’ve put together a list of our favorite simple jewelry pieces. These are pieces without the frills but just as pretty. The jewelry items on our list are not necessarily classic styles, but these ideas will come in handy when you buy precious & semi precious stones jewelry. 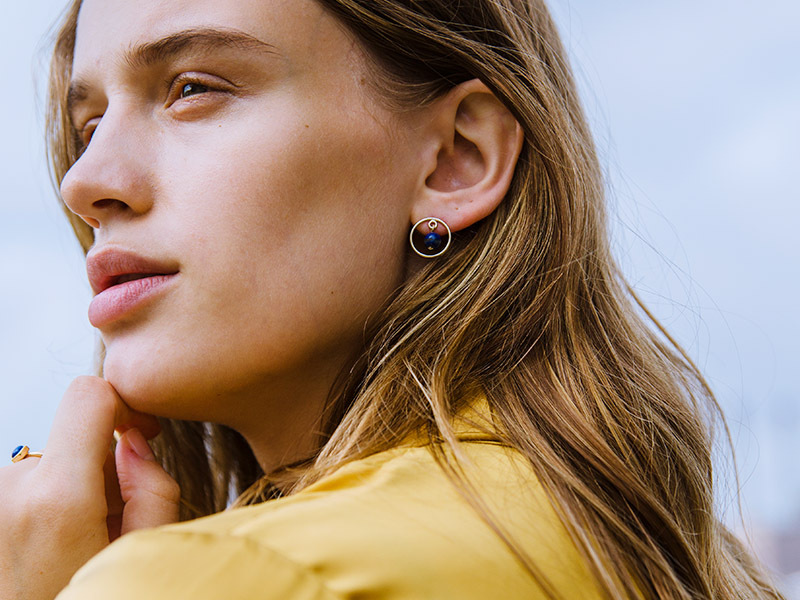 We’ve chosen the jewelry based on simplicity in design. These are pieces that a minimalist would gravitate to naturally but any woman can incorporate into their style. Read on to find out what has made our list. Okay, this jewelry item has earned a lot of attention from us. We’ve named solid gold hoops as an essential jewelry piece several times. It really is, though. We cannot imagine our jewelry collection without this trusted pair. 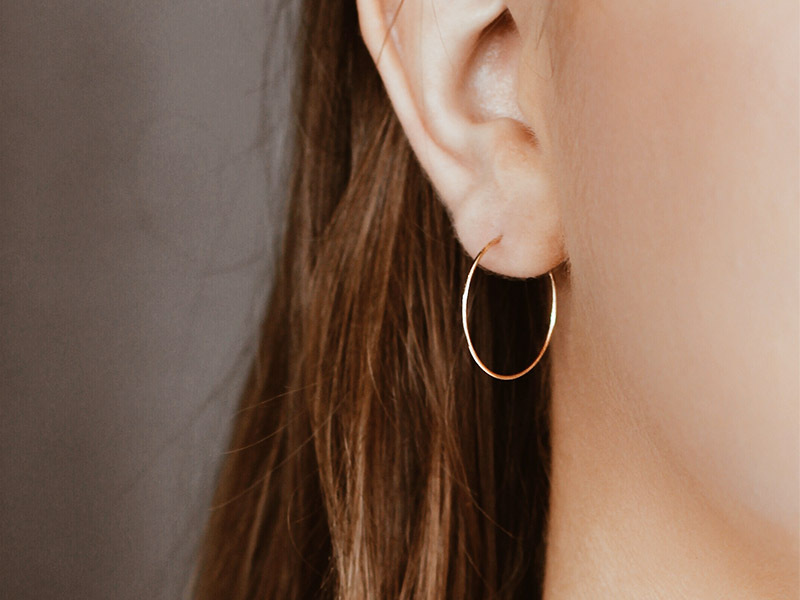 Nothing is as simple as a solid gold hoop earring. Yet, it is extremely versatile and fits into any style. All you have to do is decide on the size that works best for you. Solid gold hoops top most lists. This won’t be the last time you see solid gold hoops on one of our lists either. So, just embrace them. Simple does not necessarily mean a single color. A colored gemstone pendant necklace can still have very simple style lines. The key is to choose a minimalist chain and pendant design. Also, choose the right size. For a simple jewelry piece, we prefer a princess length necklace with a smaller pendant. For the chain, we recommend a box, ball or snake chain. Larger curb chains are also very trendy right now. Match the box chain with a square pendant shape like princess cut, baguette or radiant. You can pair the curb and ball chain with a round shape or oval. A pear or marquise shaped pendant complements a snake chain. By keeping similar style lines the overall look is more uniform and so more simple. This is a classic jewelry piece that has also made it on our list of favorite simple jewelry pieces. A tennis bracelet is simple because it is a strand of square diamonds and nothing else. This is an excellent example of less is more. You might say that diamonds are not simple but we disagree. Diamonds are not just for the special occasions. You can easily wear diamonds with your casual outfit. The key is to keep the bracelet thin and the diamond size uniform. This keeps the design clean and minimal. You can also opt for cubic zirconia if diamonds are not your favorite gemstone. We are calling it on this one, threader earrings are going to be a classic jewelry piece. It is only a matter of time before this genius simple jewelry piece gets the credit it deserves. We love how these earrings are subtle yet still edgy. This is the style to go for when you want a longer earring but don’t want any embellishments. We recommend a solid yellow gold or a sterling silver. This is because the entire earring passes through your ear so we only want the safest materials for you. For an added element choose a threader with a bar at the end. This is the simple jewelry list, after all. We have all brought home a souvenir ring. This is a ring that we bought on vacation at a local artisans market or boutique jeweler abroad but never wear at home. There is something about being on vacation that makes us think we will wear something different from our regular style. More often than not, it is a jewelry piece that will disappear to the bottom of the jewelry box. Consider the fifth simple jewelry piece on our list a challenge for your next vacation. Browse around for a simple ring, instead. A sterling silver in an interesting shape or a simple band with a small gemstone characteristic of the place you are visiting. These are the kinds of souvenirs that you won’t regret buying once you get back home. What do you think of our list of top five simple jewelry pieces? Are these pieces that you need to have in your jewelry collection, too? When you look at the jewelry trends, it might seem like each designer is trying to one-up the others. Big and bold jewelry is very hot right now. However, trends come and go. Sometimes, it is okay to tone down your jewelry a little. 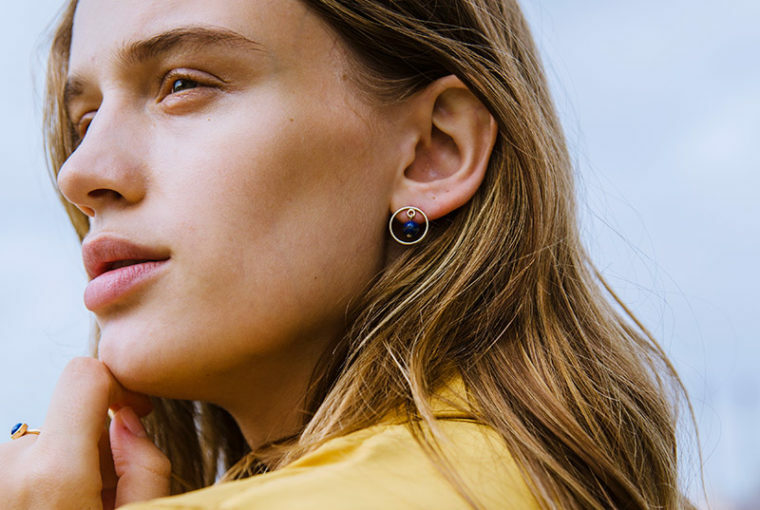 Simple jewelry pieces can speak volumes on your personal style. For more on jewelry trends and essential items for your jewelry collection, keep reading through our articles. Take a look at Ana Luisa’s unique fine jewelry collections to discover essential pieces that you will fall in love with.